Kofi’s latest album features his work with The Organisation and savors a retro feel. LONDON—“I don’t think I set out to create a retro concept, but it’s mostly what I hear in my head. Because I grew up in the 1970s, the music of that era which I love is deeply rooted within my musical ear,” says saxophonist Tony Kofi of this latest collection, which features the classic organ sound of The Organisation throughout. 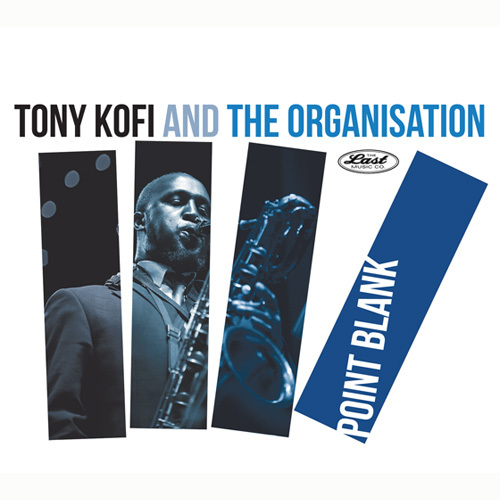 The quartet on these recordings first emerged in 2010 when Kofi, fresh from recording with Ornette Coleman in New York, joined The Organisation as a last-minute dep. His playing of both alto and baritone on the date created an instant affinity between them. The Organisation's combination of the bluesy soul jazz side of the Hammond canon, and their knowledge of the more modern post-bop side of the repertoire (as typified by Woody Shaw's "Moontrane"), worked perfectly with Kofi's approach. “I believe that the serendipitous meeting between myself and The Organisation was only a matter of time—we’re all playing on the same vibrant frequency, “ he adds. Recorded in 2017 by Paul Riley, the sounds you will hear on POINT BLANK are as golden as that first encounter, enshrined in one magical session at Specific Sound. Tony Kofi—a two-time winner of the BBC Jazz Awards among others—is a British Jazz multi-instrumentalist born of Ghanaian parents who plays Alto, Baritone, Soprano, Tenor saxophones and flute. He 'cut his teeth' in the “Jazz Warriors” of the early 90’s, and went on to establish himself as a musician, teacher and composer of some authority. Kofi's playing has been a feature of many bands and artists he has worked/recorded with include The World Saxophone Quartet, Donald Byrd, Branford Marsalis, Lonnie Smith, Eddie Henderson, The David Murray Big Band, Abdullah Ibrahim, Macy Gray, Harry Connick Jr., Jamaaladeen Tacuma's Coltrane Configurations and Ornette Coleman. The origins of The Organisation go back over a decade and grew from Simon Fernsby's memorable Manhattan Project sessions, which were a staple of jazz in south London throughout the 2000s. Drummer Pete Cater was an early recruit having been a jazz tutor on Fernsby's music college course. The band went through several incarnations but came into its own with the addition of organist Pete Whittaker and honed its no-nonsense, hard-hitting style as a house rhythm section for multiple venues and festivals. The album is slated for release August 31st. 2017-2018 The Last Music Company, Ltd.